Click to enlarge. Top left: corded petticoat. 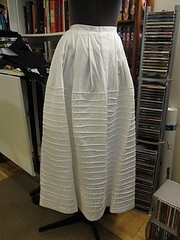 Right: petticoat with flounces. 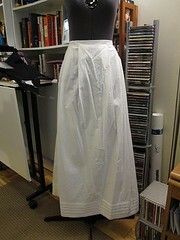 Bottom: tucked petticoat. Click to enlarge. Left: from the Manchester Gallery of Costume. Right: from the Kyoto Costume Institute. Notes: Begun June 2007, finished September 2008. 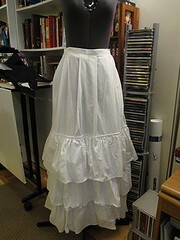 The bottom layer is the corded petticoat, then the flounced one comes next, and the tucked one is on top of that.